Dalry Ayrshire, New Street, the principle street, begins at Biggart's Mill, seen in the distance and ends at the Cross. Dalry Square, the Parish school used to be on the site and is now the local library, on left. The King's Arms on right hand side was once the town's main coaching inn. Ironstone Pit Workers c1907. Thomas Law GGGGF and sons John and Alexander Law were Ironstone miners in Dalry. Backbrae - the area where John Law and Janet Jameison lived and Janet died. Rebuilt housing today 2014. Twechar - Barrhill Miners' Rows, Kirkintilloch, further shot. Main Street in Harthill, Lanark looking to the west. This street was for many years the main road between Edinburgh and Glasgow. Horse-drawn carts make up the traffic! Main Street Harthill White-aproned shop assistants posing for the photo. Little road to left of shops led to the former central bus depot now the funeral parlour. Victoria Street is close by. Victoria Street, Harthill, Lanarkshire, where GGGF John Law died in 1899. Many of Harthill's Miners' rows were situated here. Victoria Street is named after Queen Victoria who reigned 1837 - 1901. Victoria Street today, Harthill - the old Miners' rows are now demolished and replaced with more modern housing, but still grey..
Harthill Public School. This is the second school in Harthill. Stone walls and with slate roof, it was erected in the 1870's by the Shotts School board. An Act of Parliament in 1872 made schooling compulsory from the ages 5 to 12 years. Shotts Cemetery, near Harthill, GGGF John Law is said to be buried there. Kirk Wynd no. 32, previously the home of the 'Myles' family, is now a shop, Kirk Wynd Highland House, kilt makers and a place to hire kilts! Kirkcaldy Harbour - once a busy commercial Port with ships bringing in cork and linseed oil for the linoleum industry and clay for the potteries. Cargoes of coal were exported. Merchant House opposite the Harbour - now restored (left-hand shot). Prominent shipping families included the 'Laws' but no relation!! Masonic Lodge, Forth Avenue, Kirkcaldy. GF James Law was a Mason of the Royal Arch Chapter, No. 97 in Kirkcaldy. The original stone building is no longer used and due to 'current economics' masons now have a simple 'abode' in Forth Avenue where all Chapters meet. Scottish girl spinning Flax with a spindle. A distaff or pole is tucked under the arm which has a cone or 'cage' at the top. Later in the 18th century the use of spinning wheels and machines were used. Linen Factories were set up at the beginning of the 19th century. Power looms were used but they proved difficult for linen due to the inflexibility of the fibre. The shuttle was automatically thrown backwards and forwards and young girls were employed to tend the looms, mend broken warp threads and keep the shuttles supplied with spools of weft yarn. Janet Myles was a Linen factory worker. NZ was in need of farm, domestic labour, skilled workers e.g. in 1900 - 1915 when the first 'Law' ancestors emigrated, Janet Gardner (Law), daughter of GGGF John Law and sister of Thomas Law, GGF. 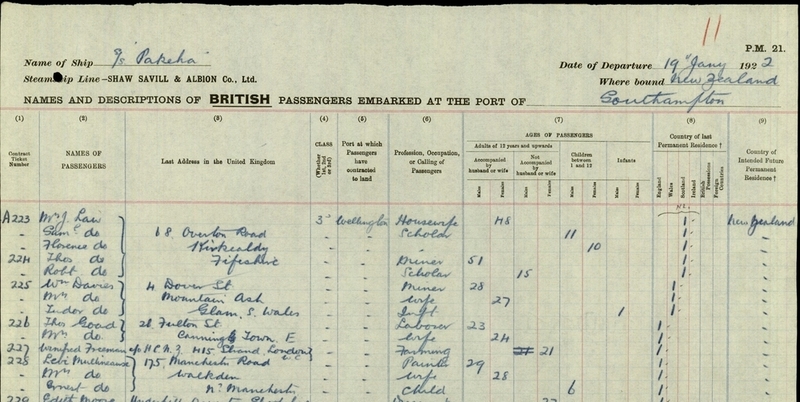 Pakeha ship Passenger List showing the 'Law' family (Thomas Law GGF and wife Janet Law (Myles) and children Sam, Florence, Robert) were living at 68 Overton Road, Kirkcaldy before they left for NZ, 19 January 1922. 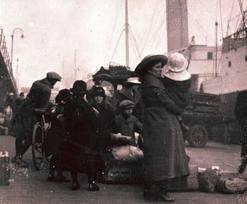 Families waiting to depart at the docks near their ship..
Next stop Wellington, New Zealand and a new life! The Photobook of the above Ancestral Journey in Scotland 'Law Family'. Please Contact me if you wish to order a Copy. I wanted to visit the places my family came from to try and better understand where they lived, worked and died and to recapture the social history of the time periods. It has been an important journey in the quest for my 'Law' roots and brought the Story to life! Law Family Crest and Coat of Arms (shield). Ermine; a red diagonal band accompanied by two blue roosters. Above the shield and helmet is the Crest, a head and neck of a naturally coloured Unicorn. Law Motto (war cry) 'A mind that respects alike the laws of mutual justice and of God'. Law is the old Scots word for 'hill'. I began this journey in Dalry, Ayrshire on the West Coast and ended in Kirkcaldy, Fife on the East Coast and last residence of the 'Law' family before they left for NZ. This is where the Ancestral Journey begins when the ‘Laws’ returned from County Antrim, Ireland. My GGGGF Thomas Law and family arrived in Dalry about 1850, mid 19th Century. He was a labourer and worked the land in Ireland but due to potato famine and the development of the Iron mines in Dalry, notably by Blair and William Baird and Co. decided to return to Scotland. It was only a short distance across the Irish sea to Aryshire from Co. Antrim and many immigrants from Ireland and Lanarkshire flooded into Dalry. The population increased from 4,800 in the 1840’s to 11,000 by the 1871 census and it became the third largest town in Ayrshire. Older industries included the manufacture of cotton and carpet yarn, silk, harness weaving and spinning of flax. Women earned 1p/hr for sewing and embroidery. It was the limestone, coal and ironstone industries that helped Dalry develop into a thriving mining community. The blazing furnaces, smoke from coal pits and white emissions from limekilns could be easily seen. Iron was smelted in furnaces of the four great iron companies - the Ayrshire, the Glengarnock, the Eglinton and the Blair. There were x5 coal pits in 1836 but the coming of the railroad from Glasgow to Ayr, which went through Dalry, led to the exploitation of the abundant ironstone. It was still a time of depression but the chief employment changed from weaving to mining and by the 1860’s, 33 mines were being worked. The 1851 Census records were the first I could find for the Law’s who were living (renting) in Peesweep Row, Parish of Dalry. The family, all born in Ireland apart from William, included Thomas Law and wife Margaret (Knox), children John, Ann, Alexander, William 2months old, Thomas’s mother, Susan McKrae and brother in law, Samuel Knox. GGGGM, Margaret Law (Knox) died in 1863 in Peesweep. Peesweep Row, Stoopshill and other parallel Miners rows are now demolished and all this old miners’ housing area is known as the Blair Estate in Dalry. Blair Rd runs through the middle and the Blair Estate is at the far end. This has the wonderful Blair house and woodlands now open to the public. The old Miner’s Rows were built by the Mining companies. Front Row. William Baird & Co. owned the Peesweep Row. The front row consists of 11 houses of two apartments, built of stone. Single story connected buildings. (other Rows would be in parallel) At Peesweep, houses were built back to back as in the ‘Double Row’. There were two rooms, the kitchen measured approximately 15 feet by 11 feet and the other room 11 feet by 9 feet (some data says 14 x 11 and 8 x 6) and there was a cupboard containing a set – in bed. For a two room house, the rent is £3 12s per annum or, 1s 6d per week. Facilities were primitive. There were four dry-closets provided for this row, four ashpits and four washing-houses only, so often clothes, miners and family, had to be washed in tin tubs on the uneven brick tile floors. Some Rows had no wash houses or coalhouses! The roadway in front of these houses was often in a miserable condition with 'muck' but red 'blaes' helped to keep it dry. No coalhouses were provided, except where tenants had built for themselves, and they had to keep their coals below their ‘set in’ beds sometimes on the bare earth. Although there was no piped water supply, housewives took pride in having the whitest washing! There would have been a strong sense of community as everyone used the same shop or school for the children which was often provided by the mining company and sometimes there was a communal vegetable patch. Infants often died very young however due to damp, poor living conditions and infections. In 1851 Census, Thomas is now working in the Mines and is an Ironstone Miner as seen in 1861 Census along with his sons Alexander, only 12yrs old! John 17yrs. His daughter Ann, 14yrs, is working in the Woollen Mill in 1861 census. In the 1870’s Spinning mills were also opened by Thomas Biggart which grew to become the biggest employer in Dalry, although the workers were mainly women. Around 1816, Alexander Baird began working coal leases in Lanarkshire, Scotland, and, by 1826, he and his sons owned numerous coal and mineral leases there. In 1828, two of these sons, William and James, began to erect the Gartsherrie Ironworks at Gartsherrie, North Lanarkshire, Scotland, and within 15 years the works had grown to be the largest in the country with 16 furnaces. In 1830, William and James took over all the coal leases and formed the partnership William Baird & Co. In approx. 1843, William and James Baird were involved in the establishment of the Eglinton Iron Company that managed the Gartsherrie Ironworks, building furnaces at Kilwinning, and purchasing those at Blair and Dalry, North Ayrshire. Baird's became responsible for 25 per cent of Scotland's output making them the largest producers of pig iron in the world and gained a reputation for technical sophistication, attracting visitors from England, Europe and America. The Bairds provided schools, churches and recreational institutes for their work force but opposed trade unionism. In 1871 the furnaces in Dalry finally ran out of blast but ironstone mining continued for longer. The coming of the Biggart Mills helped a prosperous period for the next 20 years. By the end of the century most mines were worked out and the only local employment for men was in the brickworks. From the approaches to Dalry the view today remains very much the same as it has always been..
Dalry Square is dominated by the churches as it has throughout the town’s history. The motor car replaces the horse and cart! A cup of tea was £1.00 in the delightful Penny Farthing Tea Rooms in 2014 and locals still spoke of older relatives born in Peesweep. The local Library formerly the Parish School had a wealth of local history information. Note* if a Miner or poor person could not afford a Lair (ground for grave) in this cemetery, they may have been buried in consecrated ‘Poors Ground’ and no records of names kept. I could not find any burial records for Margaret Knox who died in Peesweep in August 1863 as unfortunately there were no records for 1863 in the Cemetery. GGGM, Janet Law, (Jamieson), died in Backbrae, Kilsyth in 1874, only 22 yrs old! Kilsyth is a North Lanarkshire town located between Glasgow and Stirling. It stands on the north side of the valley of the River Kelvin where to the north the land rises steeply to form the Kilsyth Hills. It had a long tradition of radical protestantism and entered the history books on 15 August 1645 when opposing armies met in he 'Battle of Kilsyth'. The Scottish Covenanters where defeated by the Royalists which left Montrose in ‘control’ of Scotland. During the 1770s and 1780s the Forth and Clyde Canal was built along the Kelvin Valley and quarrying and coal mining began in the area around Kilsyth. By the end of the 1700s textile production dominated the town, employing up to a thousand men and women, many weaving at home. The process was industrialised when textile mills arrived in the early 1800s, and at the same time the local pits steadily increased production, with much of their output being taken to Glasgow by barge. The railway took until the 1870s to reach Kilsyth and by this time it was an important centre for coal mining and quarrying. In the 1920s there were seven pits in and around Kilsyth, and the town's housing was judged to be some of the most overcrowded in Scotland. The influx of Roman Catholic immigrant workers from Ireland also led to outbreaks of sectarian violence in 1905. As a result of the amount of drinking by miners and the consequent poverty and violence at home, the town was voted ‘alcohol free’ between 1923 – 1967. By then, Kilsyth was no longer served by a railway and the pits had gone. The large Dumbreck Colliery closed in 1963. Handloom weaving was one of the first main industries in Scotland and many of the Jamieson family worked as cotton weavers. Both the spinning and weaving of cloth were originally carried out by people in their homes and later factories employed weavers. Weaving is a method of fabric production in which two distinct sets of yarns or threads are interlaced at right angles to form a fabric or cloth. The longitudinal threads are called the Warp and the lateral threads are the Weft. The way these interlace with each other is called the weave. Cloth is usually woven on a Loom, a device that holds the warp threads in place while weft threads are woven through them. In 1873, Iron Mines: e.g. Balgrochan, Drumellier, Dumbreck, Inglestone, Riskend, Twechar was owned by William Baird and Co.
Coal Mines e.g. Highland Park, Balmalloch owned by Brown and Rennie, Riskend, Twechar, Ingelstone, Kilsyth owned by William Baird and Co. There were also many fatal accidents in the coalpits, the roof would cave in or workers could be poisoned by gases, leaving widows with many young children. Kilsyth Today - the town economy has shifted over the past three centuries from Farming, Handloom Weaving and Mining to light engineering, transport and service industries. The old miner's rows and other slum accommodation has now been removed and in recent years, several small housing estates have been developed at either end of the town. Many workers now commute to Glasgow or other larger towns. Thomas Law, my GGGGF and x5 of his children, Alexander 22yrs, William 20yrs, Samuel 18 yrs, Thomas 16 yrs and Susanna Law 13 yrs were all living in 27 Twechar Row, Kirkintilloch in the 1871 Census. Thomas and his sons Alexander, William and Samuel all worked in the mines in Twechar. Thomas’ wife Margaret, died in 1863 in Dalry and it is likely he came to Twechar with most of his family to live and find work in the mines for himself and his sons apart from John, now in Kilsyth. His other daughter Ann stayed in Dalry. Twechar was a small former mining village in East Dunbartonshire and lies between the larger towns of Kirkintilloch and Kilsyth. The Forth and Clyde Canal runs close to the village. Baird & Co. provided rail connections to their local pits at an early date but for many years much of their coal was transported to market by canal boat. There is also a Roman Fort which is a local tourist attraction. It was not until the coming of William Baird & Co. to the area, about 1860, that a close-knit mining community was created. Pits were sunk at Twechar and Gartshore and a row of workers' houses was built on the south bank of the Forth and Clyde canal, just east of Twechar Bridge. The coal mining industry lasted for just over a century. Twechar No.1 Pit, on the north bank of the canal to the east of Twechar Bridge, closed in 1964, while Gartshore 9/11, the very last colliery in the area, was shut down in 1968. Thereafter some Twechar men travelled daily to other collieries in Lanarkshire until they too were closed, during the early 1980s. The original housing provided by William Baird & Co e.g. Twechar Rows, soon proved inadequate and around 1880 the Barrhill Rows were constructed at right angles to Main Street, on its western side. Initially the houses had no sanitation and were lit by paraffin lamps. Communal wash houses were provided at intervals along each row. Most of the houses were two apartments (room & kitchen). Twechar Today is still a small, quite depressed area although it is surrounded by lovely countryside and the canal. Currently it is undergoing regeneration via the EDC (East Dumbartonshire Council) and private enterprise. Kirkintilloch has come a long way in 800 years. From a tiny settlement to having Scotland’s first railway, the country’s first inland port, first canal and is the home of red telephone boxes! made by the Lion Foundry. GGGF John Law’s daughter, Margaret, lived and found work in New Monklands as a domestic servant as this would still have been a busy and prosperous area. At 19yrs, she had an illegitimate daughter Janet, born 1890 in Avonhead, New Monklands. She also married Robert Gardner in New Monklands presumably before they went to live in Harthill, Lanark not far away. She followed her husband, Robert to NZ in 1912. Hand loom cotton weaving was the first major industry in the area, but was in decline by the beginning of the 19th Century due to the advent of power looms. In the 1830’s a new industry, coal, had become established and the Monkland's canal and later the railway transported produce to Glasgow. The excellent quality coal and the deep black - band ironstone was mined in New Monklands e.g. Avonhead colliery. The town of Airdrie flourished. Housing conditions for the working classes were horrendous, with overcrowding, dirt and disease everywhere. Many tried to forget their lifesytles by drinking themselves to ‘oblivion’. Pubs did a roaring trade e.g in Airdrie there was a pub for every 169 inhabitants. The decline came after WW1. GGGF, John Knox (Law), died in Victoria St, Harthill in 1899 most likely at the house of his daughter Margaret, who was married to Robert Gardner and living in Victoria St. Robert registered John’s death. John Law is said to be buried in Kirk o Shotts, a large cemetery and church not far away from Harthill but no grave could be found. It is probable he was too poor for a headstone and maybe buried in consecrated poor grounds with no name or buried elsewhere. Harthill was a farming community in 1861 and grew rapidly due to the ever increasing demand for coal to fuel Scotland’s expanding heavy industries. There were abundant coal seams around Harthill and rich deposits of iron-stone brought even more work to the area. The coming of the railways made the inland transportation of heavy loads viable. Miners’ rows were erected to house the workers. The best known colliery owners were the Baillie family. The first Church was constructed and dedicated in 1871 by Revd. William Arnot. Housing - see Victoria and Albert Street photos above. Many of the miners' rows were situated here. Long lines of cheaply constructed houses, usually brick. There was no running water, collected from pumps outside. Before the pithead baths in the 1920’s, every day, miners’ wives had to heat up enough water to fill the tin bath set in front of the kitchen fire so the miners could wash away the grim from the pits. No matter how many children in each family, they all had to sleep in the two-room rented accommodation. They had box beds recessed into the walls of both rooms and younger children often slept on wheeled truckle beds, stored underneath the box beds and hauled out into the middle of the room each night. The Labour govt. in 1947 nationalised the coal industry, with Harthill pits under the control of the National Coal Board. Gradually pits closed as they were worked out and in 1988 the declining mining industry ceased in Harthill when the last deep pit of Polkemmet colliery, closed. Hartshill today is enjoying a revival as a commuter village with many residents travelling to work in Glasgow or Edinburgh. I felt the feeling of ‘pride' in its heritage when I visited. Beath is a small parish about four miles long and three miles broad next to the Royal Burgh of Dunfermline and close to Cowdenbeath. It was built by the Fife Coal Company who built houses for miners towards the end of the 19th century and the village reached its peak in size by 1910. There were 4 Pits in the area: Engine, West and two Dalbeath Pits and a Fire Clay works. Hill of Beath was busy and prosperous and able to run a senior football club, ‘Hearts of Beath’, founded in 1886. It was however a mining village where courage, hardship and fortitude prevailed for these poorly paid workers due to the ruthless exploitation by the mine-owners. My GGGF, John Knox (not using surname ‘Law’ as seen in the 1891 census) went to live with his brother Alex at no. 38 Hill of Beath. John’s son, Thomas Knox (Law), my GGF was also with him, 20yrs old. Thomas married Janet Myles, in Kirkcaldy in 1892 but they lived in Hill of Beath in rented miners’ row accommodation as Thomas was working in the coal mines nearby. They had at least x3 of their children in Hill of Beath, John in 1893, James (my GF) in 1894, Christina in 1896. The village ran from the Tavern, the ‘White Elephant’ upwards to the Co-operative store. It comprised West Row, Engine Row, Hall Row, School Row, Reading Room Row, East Row, Pond Row, and the Old Square. The Main street had long rows of houses either - side and each house consisted of x2 rooms only. There were no sculleries or washing facilities and no running water. Outdoor wells were placed at intervals in the Main street. The streets were laid with packed ash so on rainy days they turned into mud! Houses were cockroach ridden and bug infested and wives used mining carbide lamps to kill the pests in the walls. ‘Rent and a half’ was charged by the coal-owner for the next tenant, if a tenant left with rent arrears! It was harsh. Sculleries, sinks and washing boilers were installed in houses much later on. The Bing! This was the place where all the stone, dross and rubble was tipped from the local coal pit. Many of the village men, women and children went there to search in the dirt for pieces of coal as they had no money to buy it. The coal – owners decided to put a stop to this however and brought in the police to apprehend anyone caught at the Bing! Transport Very little public transport existed. Men had to walk ‘to and from work’ in all weathers and at night, sometimes 5 or 6 miles. It was accepted and no one complained. Coal was first worked in Hill of Beath in the 1830’s which was the beginning of the Hill of Beath Colliery. It passed through many hands and was sold by David Adams to the Fife Coal Company in 1887. The Engine Pit had already been sunk and had the deepest shaft in Fife. Mining Disaster On 15 February 1901, 7 miners died in Engine Pit, leaving 6 widows and 34 fatherless children. The ‘white damp’ or carbon monoxide seemed to have arisen. The men’s safety lamps would indicate the presence of ‘black damp’ and the common gas to a fiery one but a naked lamp could burn well when carbon monoxide was present which made it so dangerous or fatal..
Employment – the largest employer of men and boys was the pit. Nearly all boys followed their fathers underground and this was very true of the ‘Law’ boys. Employment in the coal mines, brick works or Foundry was very poorly paid e.g. in 1930 a boy of 14 yrs received 50p/week for an 8hr day. The Bogey-man. There was a job in the pit known as the ‘bogey-man’ - he was responsible for maintaining the haulage ropes. The Pug – the engine that drew the wagons of coal down through Hill of Beath village. The driver would sometimes throw off a lump of coal to needy children whom he knew had no fires at home. Education In 1890 a school with 70 pupils was opened in Hill of Beath. It was owned and run by the Fife Coal Company and Miss Marjory McMillan was appointed its first teacher. The school was extended to house 200 pupils when the Beath School Board bought it in 1893. Games boys loved to play included rounders, kick the can, run sheepy-run, the girls loved paldy-beds, skipping ropes and everyone, including the miners to pass away the hours, played killy or holey with marbles. In the 1930’s work started to demolish the miners’ rows and tenants transferred to new council housing. Because of WW2, demolition was not completed until the late 1950’s. Hill of Beath appeared a small community with definite signs of regeneration and a sense of pride. They still love their football team! and in 2001 erected a statue of Jim Baxter, born in Hill of Beath, as he is regarded as one of the country’s greatest football players ever. Not far from Hill of Beath and 12 miles north of Edinburgh it is steeped in history and referred to as ‘Laung toun’ in old maps as it had a 0.9ml long High St. due to the thriving Port and inhabitants had to build their houses in a line along the shore. The town also began to develop around the salt, coal mining and nail making industries. The production of linen came in 1672 and this was later instrumental in the introduction of floorcloth in 1847 by linen manufactuer, Michael Nairn. In 1877 this led to the production of linoleum (made of flax and oil) under license which became the town's most successful industry and Kirkcaldy was a world producer until the mid-1960s. GGF Thomas Knox (really Law) married Janet Myles in Kirkcaldy in 1892. Janet was born in Kirkcaldy, her family were there. She lived at 28 Charlotte St, Kirkcaldy before she married Thomas at home in 28 Charlotte St. in 1892 after Banns according to Established Church of Scotland. All children had the surname, Knox on their birth certificates. John - born 23 January, 1893, 83 Hill of Beath. He lived at 68 Overton Rd, Kirkcaldy before he married Elizabeth Mitchell McKay in Edinburgh. They then both lived in Kirkcaldy, 84 Overton Rd before they left for NZ with their daughter Janet in 1922. Apart from John, they all lived at 68 Overton Road, Kirkcaldy before they emigrated in 1922. The men moved to different mines in search of work or if a seam had dried up and had no choice but to move on. It is difficult to trace which mines they worked in. They ‘rented’ Miners row accommodation which also explains why they had so many addresses. Masonic Lodge, Forth Avenue, Kirkcaldy - see photo. My GF, James was a Mason of the Royal Arch Chapter, No.97 in Kirkcaldy. The original grand stone building has been sold but they still have an address in Forth Avenue where all Chapters meet. Linen worker – Janet Myles was a Linen factory worker in Kirkcaldy. Linen yarn is spun from the long fibers found just behind the bark in the multi-layer stem of the flax plant (Linum usitatissimum). To retrieve the fibers from the plant, the woody stem and the inner pith, which holds the fibers together in a clump, must be rotted away. The cellulose fiber from the stem is spinnable and is used in the production of linen thread, cordage, and twine. Linen factories were set up at the beginning of the 19th Century - see photo. Power looms were used but they proved difficult for linen because of the inflexibility of the fibre. Many young girls were employed to tend the looms, piece (mend) broken warp threads and keep the shuttles supplied with spools of weft yarn. Coal miners – Thomas Law, GGF, sons James Knox Law, GF, John Law when living in Kirkcaldy. Radical development of Kirkcaldy in the 1950’s destroyed many antique quarters and architecture and it now faces problems common to all Scotland’s former Industrial towns. Today - it is still a busy place, with lovely views overlooking the Firth of Forth and felt fresher, not as oppressive, as other coalmining areas visited on this journey. Local Attractions: Kirkcaldy Museum and Art Gallery, Eley, a small sea side town and Crail a beautiful small harbour town, both on the east coast. Inland in Fife, among the many places to explore include the Fife folk museum at Ceres, Falkland Palace, St Andrews. *If you would like similar information for your Ancestors, please contact me to discuss further.